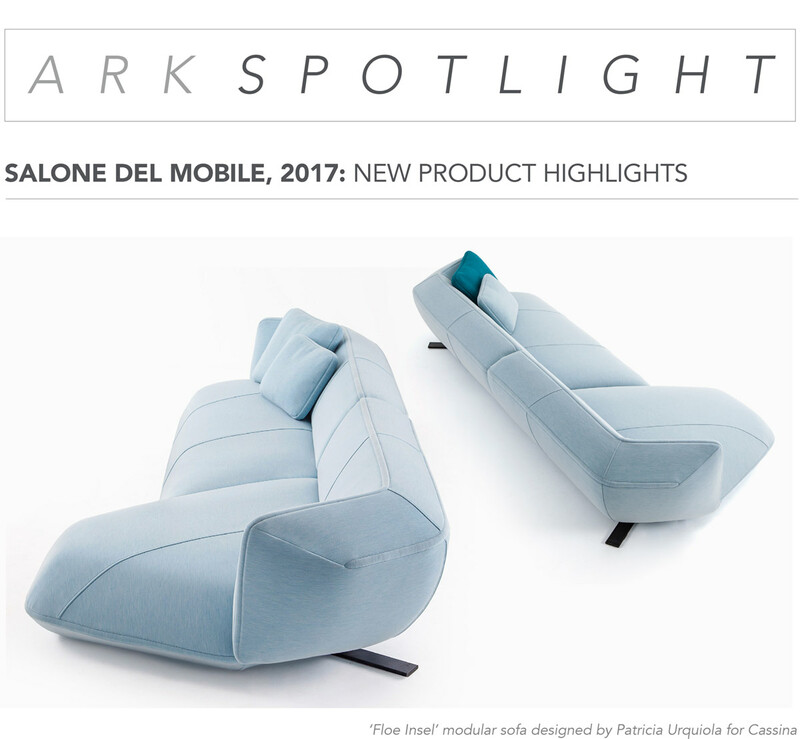 For over 50 years Salone Del Mobile has been the premier annual furniture exhibition showcasing design excellence from all over the world. We are here this week selecting new product to bring back to our showrooms in 2017. Here a few standouts we want to share with you. The Floe Insel seating system by Patricia Urquiola is on the top of our list, it’s an unforgettable modular system inspired by icebergs, whose sculptural, monolithic bulk floats weightlessly on water. A soft mass, made up of different geometric shapes resembles the forms of wafting blocks of ice. 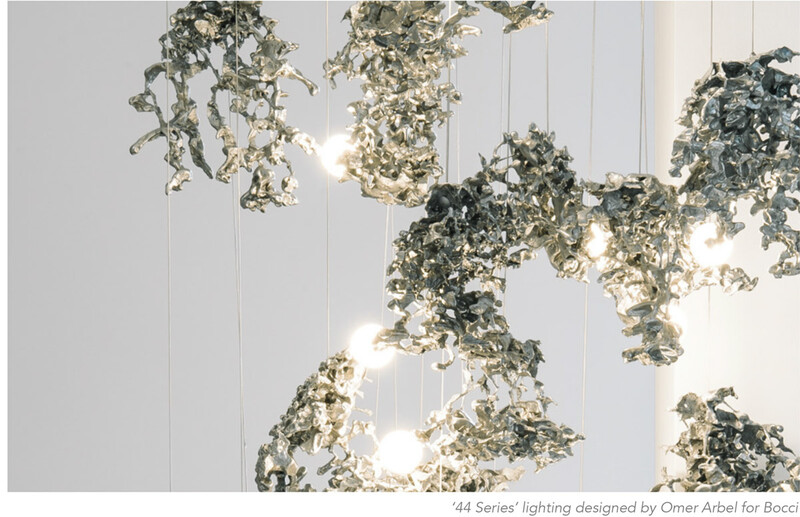 Bocci’s new 44 Series lighting does not fall short of innovation. Each 44 results from a free pour of molten aluminum into a large canister filled with rock-like modules of resin-impregnated sand, a waste product of conventional sand casting. Low voltage electricity is transmitted through the castings, allowing a light source to be suspended between them without using cables. 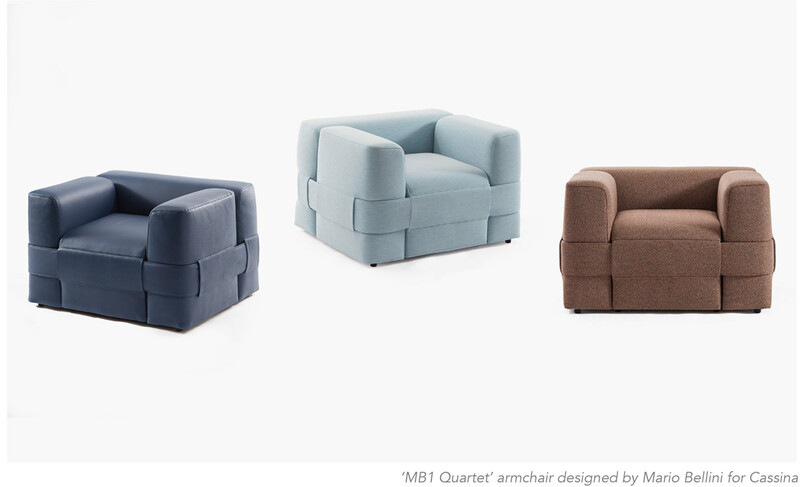 The MB1 Quartet armchair was revived in honor of the 50 year long relationship between Mario Bellini and Cassina. Working closely with Bellini, Cassina revised the proportions and upholstery of the MB1 Quartet armchair while maintaining the original spirit of the piece. The new version epitomizes the company’s expertise in leather workmanship, particularly apparent in the contrast between the exterior and the belt loops, made from soft saddle leather, and the inside and belt in natural leather. 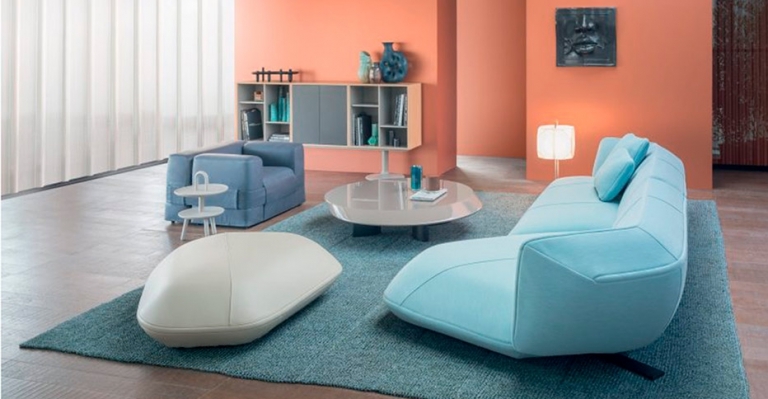 The Let It Be sofa system by Ludovica + Roberto Palomba is a tribute to the famous song by the Beatles, evocative of a period of newfound freedom from all types of formalism and convention. 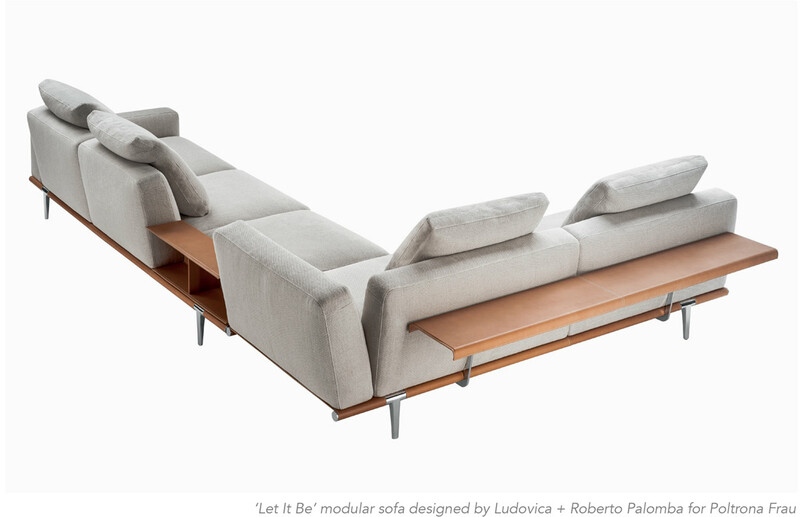 A modular system open to the most comfortable of configurations, Let it be is an invitation to relax. It can be completed according to taste with shelves and storage units that expand its functions. It is a welcoming refuge where you can finally leave your worries behind you and rediscover your own time and rhythms. 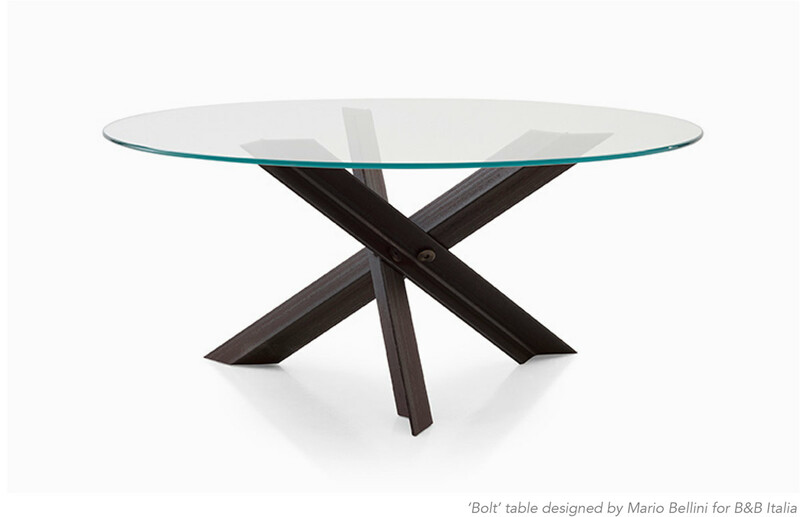 The new Bolt table from B&B Italia is designed by Mario Bellini. After various experiences of developing wooden supports for tables, the architect proposed an unusual metal structure, extremely simple, but of strong material. Three steel interfacing cross-bars in angular sections create a base supporting a round, transparent glass surface. For more information about these new products email us at sales@arksf.com or give us a call 415.565.7200. Follow our journey to Milan on Facebook.